Excerpt from "NEW TIMES FOR TIMES SQUARE"
This video begins with a demonstration by Peter Bosselmann, Director of the Environmental Simulation Laboratory at the University of California - Berkeley. Commissioned by the Municipal Arts Society, Bosselmann constructed a to-scale model of Times Square. 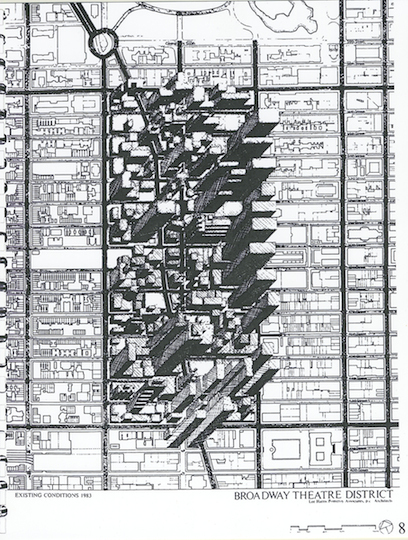 In the video, Bosselmann follows guidelines established by the 1982 Midtown Zoning Resolution to simulate what future development could lead to in Times Square. Bosselmann visualizes this process by assembling a tower on one of the sites using, first, the as-of-right height. He then extends the tower with additional sections made available through bonuses earned for developments that include rehabilitating theaters and purchasing air rights. The model was presented at the City Planning Commission hearing in September 1985 with dramatic effect. 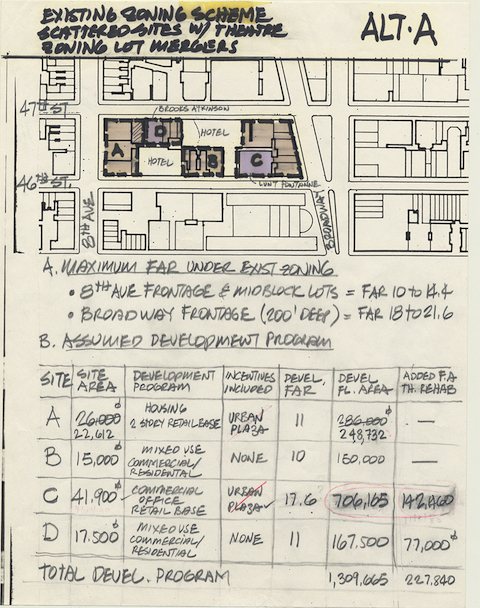 Analysis of the Zoning Bulk Regulations of the Broadway Theater District, 1983. Many feared that skyscrapers would overwhelm the Times Square district with their height and bulk and corporate office buildings and tenants would changes its essential character. 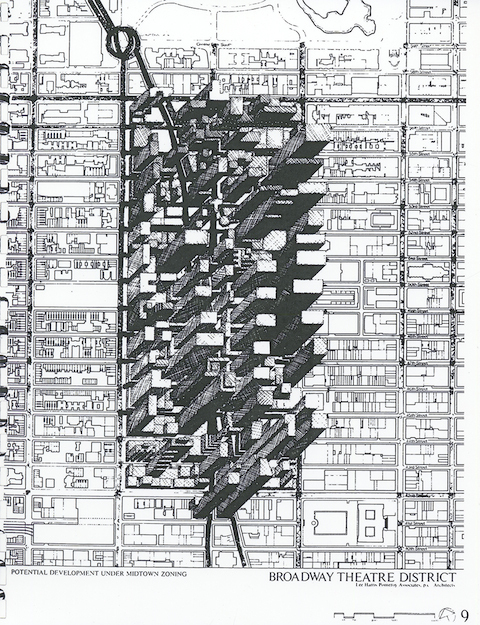 The drawings above by Lee Harris Pomeroy, an architect who led a study by the group "Save the Theaters, Inc.," pictured the contrast between the existing conditions of high-rise development in the theater district with a potential full build-out under the Special District Zoning Resolution approved in 1982. Another study of the blocks from 45th to 47th St. analyzed the existing lots and available FAR (air rights) that new development could exploit to create very bulky towers. Existing Zoning Scheme Scattered Sites with Landmark Air Rights Transfer.